Hermann has been the main organ builder in Romania, from Sibiu/Hermannstadt keeping its organs going through bad times and worse times. 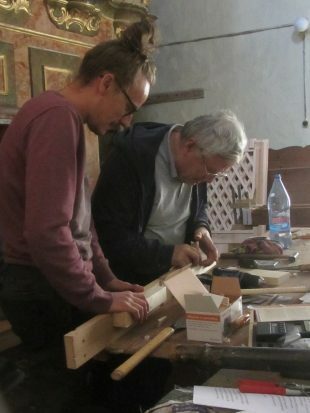 He did most of the work on this restoration project, with Szabolc Bartis of Gheorgheni restoring the metal pipes, the wind chest and the bellows. We worked together for the final week, in friendly cooperation.